In the quiet churchyard of Fortingall in Perthshire stands a yew tree that is 5,000 years old (according to some sources, at least). In the record books it has a claim to being the oldest tree in the UK, and possibly in Europe. If this is true, it means that the tree was a seedling when the Bronze Age was still a glimmer on the horizon; Neolithic people had started farming rather than roaming the landscape in pursuit of game; the settlement at Skara Brae on Orkney was occupied, and some very large stones were being hoisted onto a windswept moor at Callanish on the Isle of Lewis. The present church at Fortingall was built in the 1890s but it stands on much earlier foundations, and its origins go back to the earliest Christian times. It is dedicated to St Coeddi or St Cedd, a bishop of Iona who died in 712. One source speculates that the religious settlement at Fortingall may have been founded as a ‘daughter’ monastery of Iona. Certainly, the graveyard is littered with early carved stones, some with simple crosses etched on them and others with letters made more legible by the infilling growth of velvety moss. But it’s likely that the site itself, with the yew tree growing here, was sacred for thousands of years before that, as the tree would have been ancient at the dawn of Christianity. The yew tree was revered by the Druids for its longevity and ability to regenerate: where they graze the ground, the branches of old trees will sometimes take root, creating a new tree. To the early Christians the yew became a symbol of the Resurrection, and this is one of the reasons why it is planted in so many churchyards. An intriguing story links Pontius Pilate to the Fortingall yew. According to folklore, he was the son of a local woman and a Roman diplomat visiting a Pictish king, and he was either born under the tree or played in its branches; when he was older, he was taken back to Rome with his father. This seems such an unlikely story for someone to dream up that I wonder if it has a grain of truth! When the traveller and writer Thomas Pennant visited Fortingall in 1769 he recorded that the yew had a girth of over 56 feet; today, there are wooden pegs marking the circumference on the ground. This is because the tree has now been reduced to two still quite sizeable remnants, partly as a result of visitors taking pieces as mementoes over the years. A wall was built around the tree in the 18th century in an effort to protect it, but this didn’t deter collectors. In 1854, the tree had grown into an arch through which a coffin was traditionally carried at funerals. As you stand and look into the darkness of the hollow trunk, you wonder at the generations of children who have played here, the countless people who have flourished and faded like passing shadows in its lifetime; this tree has seen farmers, settlers, warriors, missionaries, kings. It’s difficult to believe that a living thing can survive this long. Far from dwindling into its twilight years, the Fortingall yew appears vibrantly alive; its foliage is lush and dense, although the lower branches are gnarled into grotesque shapes. Faces of dragons leap out at you – ancient spirits or products of your imagination? No wonder there are so many early burials here: the ancients viewed this tree as a source of eternal life. I’m tempted to believe them. Fortingall lies about eight miles to the west of Aberfeldy, in a beautiful rural area. The churchyard is open all year, although the church was locked at the time of our visit. That’s a shame, because inside are some Pictish stones and an early Christian hand bell. All good reasons for me to go back! Fortingall stone circles: In a field near the church at Fortingall are some standing stones, arranged in three groups. For another majestic old tree, take a look at the Birnam Oak at Dunkeld. I always feel the same way when I see ancient and venerable oaks…. what stories they could tell. What wouldn’t I give to see the events through time that they have seen! Pity they don’t have inbuilt camcorders. I know, Rachel – if only we could find a way to communicate with them! I would love to see the landscape as it was then, before the forests were cleared. No wonder these old trees are believed to hold such great wisdom. There is a wonderful book called THE STORY OF YEW by Guido Mina di Sospiro which is really worth reading. 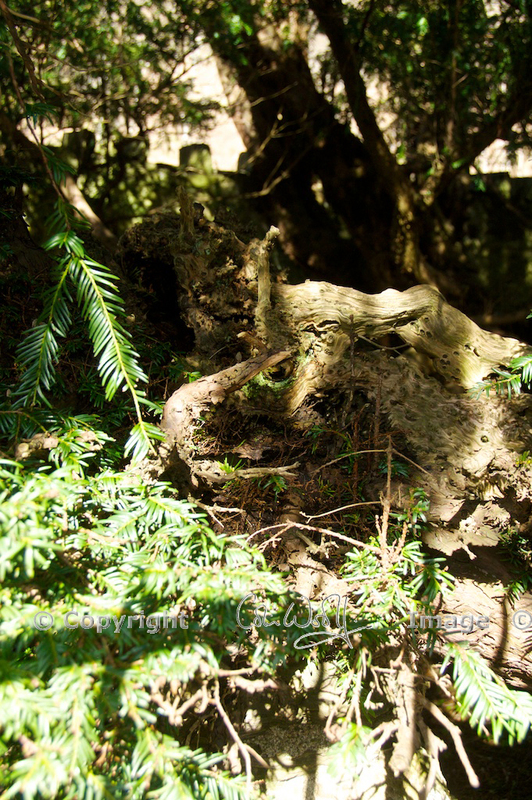 A 2000 year old yew tells its own story from being born & sprouting from the soft Earth through all her life experiences. It is a novel, fiction, & a truly magical read. Wow! Hard to imagine the Bronze Age. I know, it’s mind-boggling to think of a lifespan that long, encompassing so much history that we know so little about. 🙂 I must go back to Fortingall, because I would love to see inside the church, too! Yes, we were surprised by the thatched cottages too! It’s a very pretty place, nicely kept. I’m not sure about that story either, but the weirdest tales sometimes turn out to be true! My family lived and farmed around Fortingall and we still live nearby. My great grandfather lived in one of the thatched cottages after retiring and it buried in the churchyard fairly near the tree. Whenever I go there I feel a sense of calm and belonging and the tree has always held a very special place for me. What a lovely family history, and thank you very much for sharing this! Those thatched cottages are just beautiful, and such an unusual sight in this part of the world. The whole place does have a peaceful atmosphere, and I can see why the tree and the churchyard are very special to you. Your pictures are wonderful again & you have photographed the tree which opens Jim Crumley’s book THE GREAT WOOD. I bought my copy of the book in Aberfeldy last year when on holiday & didn’t read it until back home. How upset I was to read that I missed this magical yew tree. We have booked a week there this year in June to re-visit the beautiful countryside of Perthshire AND to pay our homage to the Fortingall Yew! Thank you, Ash! I think I will have to look up that book, and also The Story of the Yew, which does sound magical. Thank you for these recommendations! The countryside around there is just beautiful – you’ll love it. Be sure to take a trip up Glen Lyon, too! I know, it was so beautiful! It’s a very pretty church, and I would love to see inside, especially for the treasures it contains! Marvelous! And a visit with sunshine, no less! Just grand. Thank you! Glad you enjoyed this. Sunshine has been in scarce supply this winter so we made the most of it! I know, we will have to show you! Pontius Pilate was the judge who is supposed to have condemned Christ. He was therefore a Roman, so the story about his connection with the yew tree could have some truth in it! Although the Romans did not spend an awful lot of time north of Hadrian’s Wall. It’s very hard to believe that Pontius Pilate story, although it makes for quite a tale. I feel proud of that tree, even though its survival over thousands of years has absolutely nothing to do with me. When I’ve visited it I’ve felt strangely patriotic. Your pictures are excellent, it’s not easy to photograph. I’m not sure if I’ve been inside the church, but I don’t think so. I want to go now after reading of the treasures within. I felt a bit sorry for the tree, after all it has been through – you can see its vast original girth pegged out, and there is mostly bare earth there now. And with the wall around it… it was a bit like visiting someone in hospital! But there is still a very peaceful feeling there. You’re right, it was tricky to get a good photo! I would love to go and see the old hand bell and the Pictish stones. However, I’m not sure how to find out when the church is open. Stunningly beautiful photos. I loved reading about the yew trees history. Truly intriguing. Thank you! It was quite difficult to get a good pic of the inside of the tree because it’s so cavernous! I wonder what has gone on under this tree, especially in its earlier history. I would love to know. Thank you for your comment! That’s a good read, Jo. The Pontuis Pilate story is fascinating. The Roman empire was a vast and multi-cultural place, and if I’m not mistaken there was at least one emperor who was born in Britain, so it’s perfectly feasible that an official could be born in one province and find himself meting out justice thousands of miles away. You’ve convinced me about this, Alen, partly because I really want to believe it! I can’t see how or why someone would just make up a story like that. It’s also interesting because I’ve just been re-watching a series on the ‘Face of Britain’, looking at the typical facial features of people in different regions. Celtic, Anglo-Saxon, Viking, Norman – but no one really thinks about the genes left by the Romans. Did they in fact leave any at all? They must have. Their genes must be in all of us.The Romans occupied much of Britain for 400 years and many of our modern towns and cities grew up around their settlements. But they weren’t just Roman, they were from every corner of the empire – Africa, the Middle-East, eastern Europe, Spain, the lot. Unlike the Normans, who were largely an elite who displaced the top level of society, the Romans integrated with everyone. They made better wine than the Normans as well. And that’s good enough for me. That explains why some people didn’t want them to go, then! 🙂 Whereas I’m sure they would have been glad to see the back of the Normans! But I would still like to know how many Roman genes we really have. Even 300 years is a good age, by any standards. But when you think of the age of this yew tree, and the gales it has withstood, it’s simply a miracle it has survived.